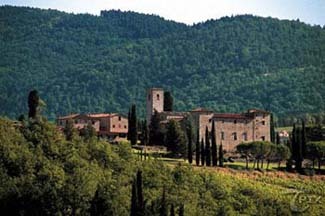 The ancient feudal hamlet of Castello di Spaltenna includes a church and 1000-year-old bell tower. The castle itself, which began life as a monastery, dates from the 11th century and is documented at nearby Coltibuono Abbey. Ask for a room with a view of the valley, which is much nicer than the view of the town of Gaiole in Chianti. The corner rooms, with heavy lattice wood beamed ceilings are the best. The castle is about 25 km north of Sienna. Gaiole has a bus stop; the nearest train station is 21 km away in Montevarchi. This former monastery still retains some medieval touches with its beamed ceilings, terra-cotta tiled floors, and thick stone walls. Guest rooms can be in the main building or stone annexes. They are tastefully decorated with country-style antiques and wrought-iron bed frames; some have fireplaces and Jacuzzis. An internal courtyard transforms into a candlelit, flower-filled dining area every evening, with harp or violin music to serenade patrons. On cooler evenings, dinner is moved indoors to the ancient cloister.